Previous referendums on European Union treaties contain many lessons and insights into the upcoming referendum in the UK. 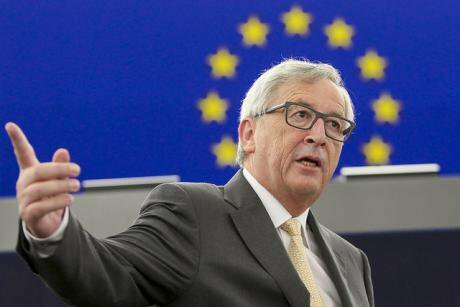 Jean-Claude Juncker, president of the European Commission. Martin Schulz/Flickr. Some rights reserved.Referendum campaigns matter more than election campaigns. Research has shown time and time again that people tend to change their minds during a referendum campaign, especially when the subject is an unfamiliar one, and the politicians line up in a non-traditional way. Voters then rely on campaign information to make sense of the referendum proposal, and the way political actors present the issue makes a difference. This is typically the case in referendums on the European Union (EU), and even more so when the referendum question concerns EU treaties, which are considerably technical and long. Besides being unfamiliar with the EU’s unique terminology, European citizens lack direct interaction with EU institutions in their daily lives. In addition, these campaigns often pitch the parties in the middle against those that are at the extremes of the political spectrum. The far left and the far right come together in their fight against the proposal, forming alliances never seen in regular elections. Referendum campaigns thus have an important role in helping citizens make sense of the European treaty at hand. In the referendums on Maastricht, Nice, Constitutional and Lisbon Treaties, campaign information has been shown to be the key to understanding the vote choice. Politicians do not discuss issues objectively in campaigns. They present issues in particular ways and mobilise voters by encouraging them to think along particular lines. Indeed, the way a political question is presented can produce dramatic differences in public opinion. For example, one American study found that while 85% of respondents supported allowing a hate group to hold a political rally when the question highlighted the importance of free speech, only 45% were in favor when the question emphasised public safety and the risk of violence. This is called a framing effect. It occurs when, in describing an issue or event, a speaker’s emphasis on a subset of potentially relevant considerations causes individuals to focus on these considerations when forming their opinions. Campaigners therefore strategically emphasise or deemphasise certain aspects of a referendum proposal in order to better achieve their goals. Given the volatility of public opinion in referendums on EU treaty ratification, which arguments are used for and against EU treaties is a crucial choice. Not every political argument is equally effective. Basically, what makes an argument strong is the extent to which it taps into existing, available concerns for individuals. In addition, vivid, concrete, image-provoking, emotionally compelling arguments that contain negative information are stronger. Such arguments are more likely to be successful, as they affect individuals’ opinions by increasing the salience of the particular dimension they emphasise. What can be learned from past referendums? The referendums on the European Constitution and Lisbon Treaty present an interesting case study because both treaties were highly technical and hundreds of pages long. Four member states decided to put the European Constitution to the public in 2005: Spain, France, the Netherlands and Luxembourg. While the referendums in Spain and Luxembourg approved the treaty, those in France and the Netherlands rejected the constitution within days of each other and drove Europe into a crisis. In response, the EU declared a “period of reflection” to reconnect its citizens with the European project. The result was the Lisbon Treaty, which removed the contested word ‘constitution’ but contained the same real substance. This time only the Irish public was asked to vote on it. Interestingly, they rejected the Lisbon Treaty in 2008 but then approved it in a second vote within a year. Detailed studies argued that these rejections were caused by government unpopularity and scepticism towards certain EU policies such as EU enlargement, EU’s market-friendly fiscal policies, and the euro. However, this literature has ignored two facts. First, in all six votes polls strikingly showed that the voting publics favoured the referendum proposals before the referendum campaigns began. Second, these issues, which are presented as the cause of rejections, also existed when the early polls showing favourable attitudes towards the referendum proposals were carried out. These problems were not associated with the reform treaties at the outset. Nevertheless, the initially positive public opinion melted away in four of the six cases (including Luxembourg, where 43% of people voted ‘no’), as can be seen clearly below. Why did this occur in some referendum votes but not in others? What changed in public opinion over the interim months, and what connected that change to the referendum proposals? Based on more than 140 in-depth interviews with campaigners and EU officials, media content analyses, and public opinion data from all cases, I have found that the initially favourable public opinion before the French, Dutch, Luxembourgish, and first Irish referendums fell dramatically due to how the anti-treaty campaigners were able to frame the issue. In all cases the anti-treaty arguments suggested that treaty ratification would increase immigration; lead to market-friendly reforms; increase unemployment: promote a decline in the welfare state model; undermine national sovereignty; introduce conscription to an EU army; or even weaken domestic laws on abortion or taxation. The pro-treaty campaigns, in contrast, came across as overly technical and broad, and their argument that the treaty was a necessary institutional step toward a better Europe could not possibly match the evocative imagery of the anti-treaty campaigners. The anti-treaty campaign arguments were stronger as their themes were negative, concrete, and immediate, as opposed to the pro-treaty frames that highlighted abstract, technical, and non-immediate benefits. In the French, Dutch, and first Irish referendums, the anti-treaty campaigners were simply better framers. In the Spanish and the second Irish cases, what differed was primarily the anti-treaty side’s behaviour. In Spain the anti-treaty campaign did not link the treaty to sensitive topics, whereas in Ireland the ‘guarantees’ the EU had provided stopped the anti-treaty side from doing so in the second referendum. The pro-treaty campaigns thereby had less difficulty in conveying an uncontroversial positive message. This is not to say that the pro-treaty campaigns in these places carried the day entirely by accident. Indeed, in these two instances the pro-treaty campaigns were more strategic in crafting strong, pro-treaty frames centred on the specific country’s national interests rather than on the good of the EU as a whole. How the campaigns of both camps play out are therefore very important for understanding voting behaviour in EU referendums. "One way" for the Non? 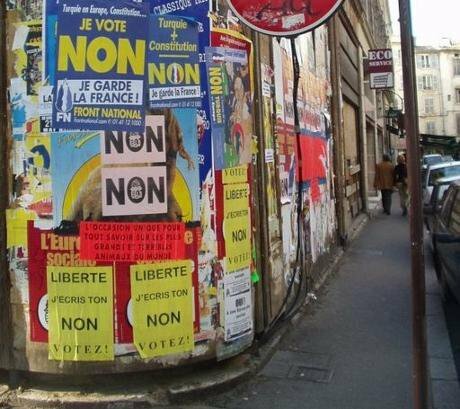 Referendum campaign placards in France (Avignon) in May 2005. Philipp Hertzog/ Some rights reserved.For instance, one of the strongest arguments in the French campaign focused on the draft Bolkestein Directive. This unrelated bill concerned the creation of a single market for services, yet the anti-treaty camp effectively used it to raise the spectre of social dumping as a potential consequence of the referendum. That this framing found fertile ground is in large part thanks to the broader context of French politics at the time, which had seen large trade union mobilisations, massive strikes and walkouts across the country due to proposed pension and work hour reforms since 2003. In March 2005, the anti-treaty campaign opened a discussion on the draft Bolkestein Directive as a concrete way to tie labour concerns to the referendum proposal. They suggested that, if services could freely circulate in Europe, it would lead to competition between workers in different parts of Europe and result in a downward wage war. The famous expression was the ‘Polish plumber’ who would come take jobs away from the Western Europeans. This was of course an argument that could appeal to both left-wing and right-wing voters, albeit from different angles. The anti-treaty campaign brought this directive into the campaign as an example of the European Commission’s market-friendly agenda, arguing that the European Constitution was consolidating these ‘anti-social’ rules in a constitutional document, thereby “carving it in the marble”. Not surprisingly, this argument gained traction right away, and the campaign witnessed a significant increase in the ‘no’ vote intentions in March. Francine Bavay, a member of the executive committee of The Greens and an anti-treaty campaigner, told me in 2008 that the momentum of the ‘no’ campaign was built specifically with the Bolkestein Directive example, which helped people understand what was at stake. From the ‘yes’ side, Olivier Ubéda of the governing party UMP suggested to me around the same time that this directive ‘was huge’ and that ‘it was the devil for French people’. This was not the only strong argument in the campaign. 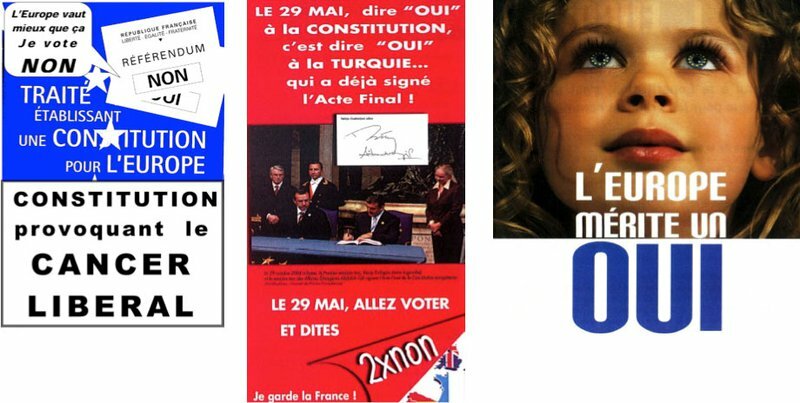 As a selection of posters demonstrate below, the French right-wing anti-treaty campaign used images of the Turkish prime minister signing the European Constitution, implying (misleadingly) that the treaty would advance Turkey’s accession into the EU. The pro-treaty side, in response, fought back with abstract posters of a child with the EU flag reflected in her eyes, which did not successfully counter these efforts. The Dutch referendum, meanwhile, found its touchstone in the potential loss of national sovereignty. As in France, the framing of the Dutch anti-treaty campaign effectively linked the public’s existing concerns to the European Constitution. Rather than focusing only on labour issues, however, it highlighted the danger of losing social protection and sovereignty in a European ‘super-state’. Using a poster showing a map of Europe without the Netherlands, the ‘no’ side successfully struck an already sensitive nerve given unpopular welfare state reforms and the recent assassinations of populist politician Pim Fortuyn and the controversial film-maker Theo van Gogh – both easily linked rhetorically to increasing immigration in the Netherlands. The result was an about-face of public opinion on the constitution. Hans van Heijningen, the secretary-general of the socialist party, mentioned to me in 2008 that a referendum required a different type of strategy from regular elections as the messages of the radical left could not possibly carry them to 51% in the Netherlands. They incorporated the ‘super-state’ argument strategically, as their other arguments had clear left-wing political content. Bas Eickhout, a ‘yes’ campaigner for GreenLeft, explained that their campaign leaflets presented balanced thinking while the Socialist Party’s map bluntly showed that the Netherlands would disappear: “Then you are asked to fight an uphill battle. They say it is a disaster, we say it is not that bad. It was very difficult”. The images below illustrate the difference in tactics well. Spain showed a different picture. In contrast to the other European Constitution referendums, in Spain the evolution of public opinion on the treaty did not show any unexpected fluctuations or sudden dips. The absence of strategic anti-treaty campaign framing resulted in pro-treaty public opinion remaining at its initially high levels all the way through to the referendum vote. The two exceptions here were the regional anti-treaty campaigns in the Basque Country and Catalonia, which used arguments building on the contentious EU non-recognition of regional identities/languages. The ‘no’ vote percentage was significantly higher than the national average (17%) in these two regions: in the Basque Country (33.6%) and in Catalonia (28%). Where the anti-treaty campaigns were especially active, the proportion of ‘no’ votes was indeed higher. In the first campaign in Ireland, much like in France, Luxembourg, and the Netherlands, the anti-treaty side blamed the treaty for overriding Irish sovereignty, changing abortion laws, introducing EU conscription, and taxation, which were all sensitive topics for the Irish society. An anti-treaty campaign poster showed the Irish Declaration of Independence with the slogan “People died for your freedom. Do not throw it away”. The pro-treaty campaigners learned from their initial mistakes and used stronger arguments in the second campaign. Not only did they counter the anti-treaty side’s arguments by strategically securing ‘guarantees’ from the EU on the contentious themes of the first campaign, but also they ran a much more rigorous campaign with strong emotional messages particularly tapping into the unfolding economic crisis and presenting the pro-treaty vote as the only solution to it. 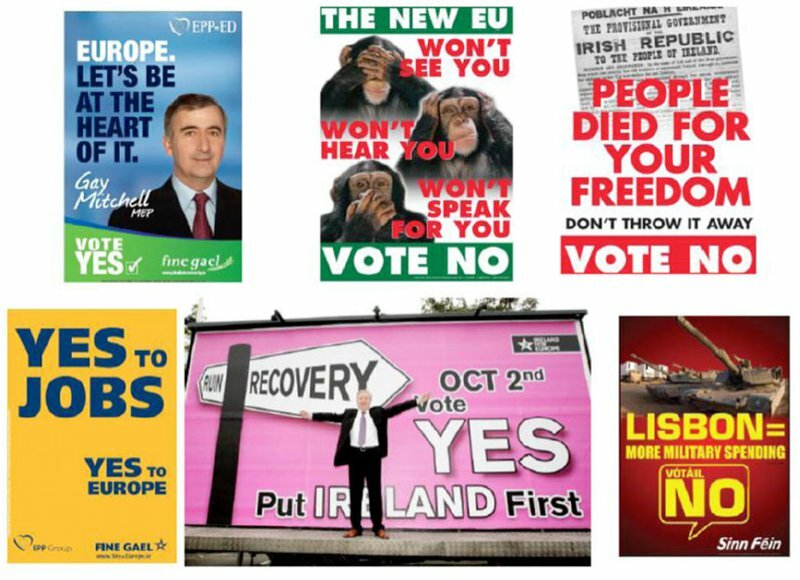 ‘Ruin or Recovery’ and ‘Yes for Jobs’ were among the new pro-treaty campaign slogans. Below, the top row presents the posters from the first campaign and the bottom row shows those from the second one. 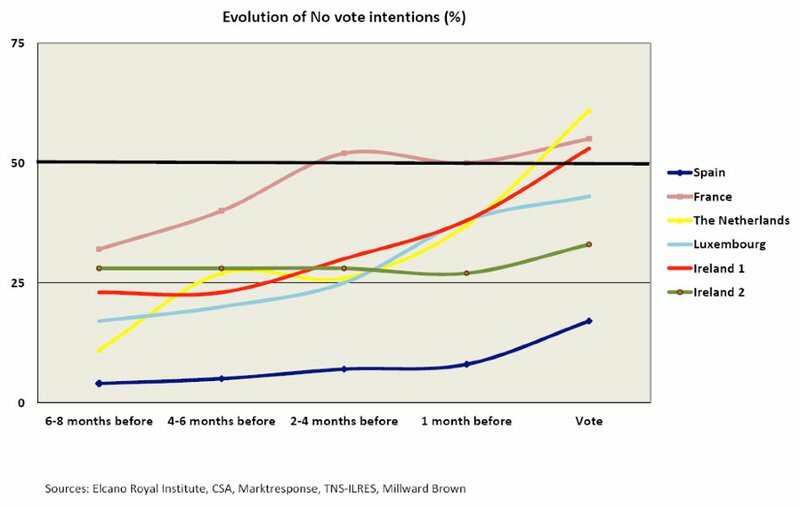 What these examples show is that the campaign argumentation strategies of political actors can, at least temporarily, reverse public opinion enough to affect referendum outcomes. Yet, framing is not the same as persuasion. Persuasion goes deeper. It implies a change in the individual’s evaluation of the subject. Framing does not alter one’s evaluation. By placing the emphasis on particular sub-issues within the broad subject, it instead increases their salience and thereby only shapes the way of thinking on the matter. When subjected to effective framing, individuals think along particular lines, but the content of their beliefs may not necessarily change. Accordingly, the success of framing does not depend on its accuracy or intellectual content but instead on its appeal to audiences. This distinction was essential in understanding the European Constitution and Lisbon Treaty referendum results. In all cases, post-referendum surveys found that public opinion on further integration returned to the previous positive levels. What happened was an episodic dip in public support during the referendum campaigns, the extent of which was shaped by the strength of campaign arguments. In the Brexit referendum, given the British public opinion towards the EU, arguments tapping into economic costs and uncertainty, immigration, national sovereignty, and renewed calls for Scottish independence will be particularly important in mobilising voters for or against the referendum proposal. The way the campaigns are run, the degree to which they each touch the existing worries of the British, and whether they do so in a concrete and emotional manner will shape the UK’s existential choice.